Many people discuss Chanel No5 as the most grossing perfume of the human history, a revelation in the industry of perfume, an innovation of classicism, I just think of Chanel No5 as a legacy, a part of Coco that stays with us, through the decades screaming luxury, pearls and Boy. Causes me tears to write this tribute, as I feel deeply bonded to Chanel as a person,not that I am by any mean as talented as she was, or that I am in any physical way linked to her, but after observing her life through books and movies and documentaries, her inner loneliness, the one people could never tell is imposed to my very soul, the sadness that most artists know well how to hide behind the laughs of success. Taking things from the very beginning in 1921 when Gabrielle“Coco” Chanel was a famous couture designer well known for her luxurious dresses made out of menswear fabrics that flatter the body without making it scream prostitution, she wanted to create perfume, special enough to satisfy her costumers taste and of course hers, introducing at the same time a new type of woman that would neither be lady like nor whore like, but more of an independent ,flapperish kind of person. After a few experiments Ernest Baux, a Russian-French chemist of that time, had Chanel choose between 9 vials numbered from 1 to 5 and 20 to 24. Chanel picked the 5thone and she decided to keep the name for the collection of her dresses, in which she would present her perfume, would take place in May the 5th, and since May is the 5th month of the year it would bring good luck for the perfume to be named No5.The design of the bottle remains a mystery. We are sure that Chanel wanted to create a less provocative bottle that would promote the essence of No5 without being too loud itself. She wanted her perfume to stand out and not the bottle that carries it(which is why she made it out of invisible glass), unlike to what other perfumers of that time did. The most possible guess is that it is designed this way so that it reminds her of Boy, who wanted to reproduce the whiskey decanter this time made out of fine glass(the perfume has a whiskey tone and the bottle could easily be a whiskey decanter, made out of fine glass indeed) (Just for the record Arthur “Boy”Capel, was Chanel's greatest love, that died in an accident leaving Chanel devastated).What is also said about Chanel No.5 is that Coco wanted it to smell like the soap she used when she was a child, while it contained more than 80 ingredients. At first, from1921 to 1922 the perfume was only given to select clientele for their purchases at the Chanel Boutique, and then in 1922 it was available at the boutique for sale. The marketing of the perfume though went crazy after Chanel cooperated with the Wertheimer brothers (in 1924) creating a perfume entity named Parfums Chanel. 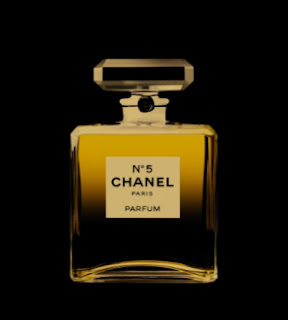 As they were rich they accepted to finance the production of the perfume to be distributed worldwide.The success was massive with, woman of the 1950s and 60s being able to buy Chanel No5 at the duty free areas at the airports of the world. The ad campaigns of the perfume have always been brilliant since it was advertised by the most iconic personas of each decade,ranging from Marilyn Monroe, Cathrine Deneuve, Nicole Kidman to Audrey Tatou and Brad Pitt, all representing the elite side of the perfume. Of course magazines such as the Harper's Bazaar and Vogue adored it and they advertised it as well through the decades. Another smart / grossing technique that Parfums Chanel did during the 1940s when world war II was killing the market, was to produce a pocket flacon that would be much more affordable for the women of that time who had no money to spend on fashion, but were instead forced to dress up with either their mens' clothes (who would serve the army, so came the birth of the militaire style) or with casual wear and sometimes with their working outfit. Despite the huge success of the perfume though, Chanel never managed to be 100%satisfied as she never managed to get full control of the ParfumsChanel. The money she earned from the sales though made her one of the most rich women of her times. Until now there has never been a more grossing and lasting perfume, with its sales and adoration by women still being present in the 21st century. Chanel No5 is, and will always be the ultimate symbol of womanity, an extension of a woman's spirit, the essence of the femme eternal..